Florida "mountain" golf is hardly "unique"
If you've played enough golf courses in Florida, you have probably come across several that bark about how "unique" they are because - lo and behold - there are hills! Golden Hills Golf and Turf Club is built on the highest point in Marion County. Golfers who have never visited the state seem to think the whole peninsula is as flat as a Wal-Mart parking lot. They're close, but not quite. Florida does have some moderately hilly terrain in certain parts, enough for several courses to somewhat ostentatiously call themselves "Florida's mountain course." There aren't any mountain golf courses in Florida, obviously - the highest elevation in the state is in Walton County at 345 feet - nor are any of the many layouts that can boast a little elevation change "unique," a word that is often used incorrectly in the English language and downright debased in golf marketing circles. • Golden Hills Golf and Turf Club in Ocala sits on top of some of the highest land in this part of the state; the tee box at No. 4, a long, serpentine par 5 with a downhill tee shot, is the highest point in Marion County, and you can see the horse farms around for miles. It's more than 7,300 yards from the back tees and known as difficult. "The low handicappers love it," said Head Professional Darren Robinson. "The high handicappers hate it." It used to be harder. Rees Jones flattened some of the table-top greens and eased some of the awkward playing corridors. 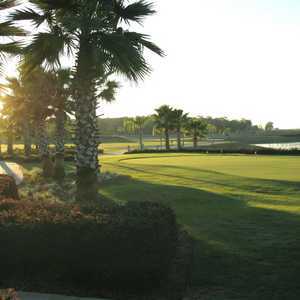 • The Black Diamond Ranch Golf & Country Club in Lecanto has 45 holes. At Black Diamond's Quarry course, the best of the three courses, the 14th, 15th and 16th are carved over and around canyon walls, and the 17th drops down into a smaller quarry to a green guarded left and rear by 30-foot-high limestone. No. 15 features 80-foot cliffs. The nine-hole Highlands course has hilltop views of up to 25 miles and the Ranch course has elevations over 100 feet. 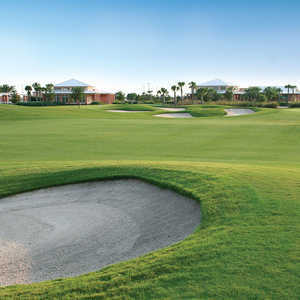 • The Sanctuary Ridge Club in Clermont, west of Orlando, is one of those that calls itself "Florida's mountain course." It has 190 feet of overall elevation change. "Otherwise, dry, sandy washes, a housing development and a scarcity of trees douses any mountain-like atmosphere. ... It may not be the Rocky Mountains but it doesn't feel much like Florida, either," a review said. "The 190 feet of playable elevation change occurs repeatedly throughout the property rather than in one steep section." The Clermont course is 35 minutes from downtown Orlando, with a clear view of the city from the course's highest point. • Highlands Reserve Golf Club is a Mike Dasher design in Davenport, with 120 feet of elevation change. It's built on a high, sandy ride with good view of surrounding areas, much of that a housing development. The course, 45 minutes southwest of Orlando, has elevated tees with putts breaking toward the Green Swamp below. There are downhill tee shots and uphill approaches, through pine tree-lined fairways. 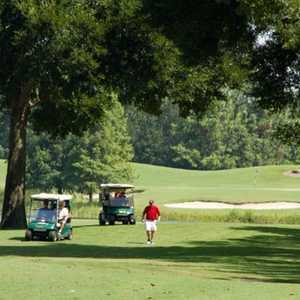 • Victoria Hills Golf Club in Deland, a Ron Garl work, is "about as Florida as a fur coat," according to a TravelGolf.com review. It has green, rolling hills and up to 80 feet in elevation, with elevated tee boxes. It's a little more than 7,000 yards from the back tees, with stunning waste bunkers and clearly defined landing areas. The golf course is advertised, as many in Florida are, as a "Carolina" experience. "That may not sound unique if you're from up there, but when you live and play in Florida, you yearn for some elevation changes and some big trees," Garl told a TravelGolf.com reviewer. • Southern Hills Plantation Club in Brooksville, 45 minutes north of Tampa, has elevation changes up to 250 feet, and at 7,557 yards from the back tees, it is one of the longest layouts in the state. It's a Pete Dye design. • Lake Jovita Golf & Country Club has deeply rolling hills and 200 feet of elevation change. The facility has two golf courses, the North and South, that play through valleys and hills and over lakes and ponds. It has naturally hilly terrain: The par-5 11th hole has a 94-foot drop from tee to green, the largest natural elevation change in Florida. Lake Jovita's South course was designed by Tom Lehman and Kurt Sandness and the North course by Sandness. • The Golf Club at Sugarloaf Mountain, the first Bill Coore and Ben Crenshaw design in Florida, is set in the rolling hills west of Orlando, built on the 312-foot "mountain" of the same name. It's a 7,057-yard, private club that allows some resort play. Get ready for the 507-yard par 4. Much of the routing follows the natural contours of animal trails. • Brooksville's World Woods Golf Club's Pine Barrens and Rolling Oaks golf courses are both designed by Tom Fazio, with the former garnering most of the media attention. Pine Barrens is rolling, pine-lined and sandy with dramatic elevation changes - for Florida - and throws long carries over waste areas at you. It's a tight layout that intimidates many but with reachable par 5s and a drivable par 4, No. 15. Rolling Oaks has live oaks, dogwood and magnolia, with multiple-tiered greens. The facility has one of the best practice areas in the state. • El Diablo Golf & Country Club in Citrus Springs has some fairly impressive elevation changes, with steep and deep bunkers, both in the fairways and greenside, set in the remote hardwoods of the Citrus County with no homes to intrude on the scenery. It's a Jim Fazio work with fast, undulating greens, 7,045 yards from the tips, with an imposing 147 slope rating. • The Dunes Golf Club was built on land that was once used for target practice for military aircraft in Hernando County; the bomb craters now serve as hazards. Close to World Woods, the Arthur Hills design is considered by some to be equal to or superior to that more well-known layout. The front nine plays through wooded flats, while the late holes follow the dip and rise of the terrain.